Heat oven to 350°F. Spray 13x9-inch baking dish or 2 1/2-quart casserole with cooking spray. In 12-inch skillet, heat oil over medium heat. Sprinkle chicken with taco seasoning mix. Cook chicken in oil 6 to 8 minutes, turning once, until golden brown on both sides. Depending on thickness of chicken, it may not be cooked all the way through at this point but will finish baking in the oven. In large bowl, stir together salsa con queso, half-and-half and chopped green chilies; stir in pepper. Place rice mixture in casserole; top with chicken. Top with reserved sauce mixture, then shredded cheese. Cover with foil. Bake 20 minutes; uncover and bake 10 to 15 minutes longer or until sauce bubbles and juice of chicken is clear when centre of thickest part is cut (at least 165°F). Cool 10 minutes. Garnish with tomatoes and cilantro. Use brown rice instead of white rice, if desired. 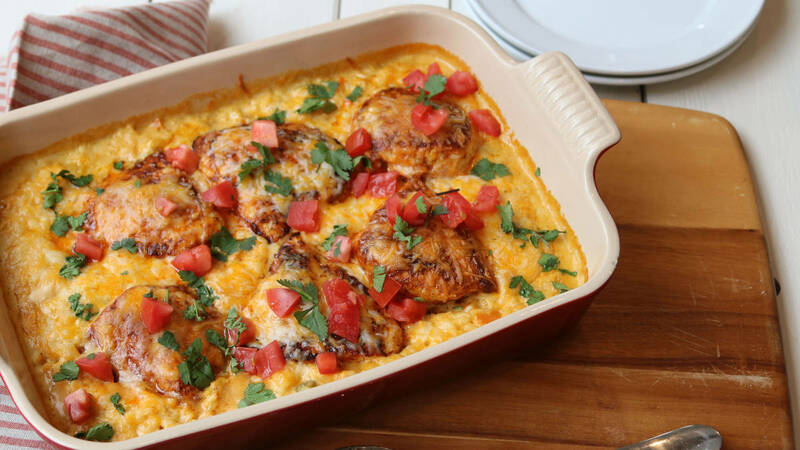 If you prefer dark meat you can swap chicken breasts for boneless, skinless chicken thighs instead!